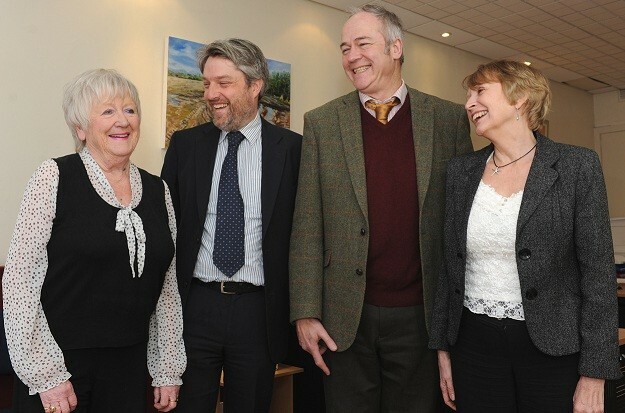 A Shropshire secretary is celebrating 55 years of service at a county legal firm. Ang Rogers is 79 years old and started at Wace Morgan Solicitors in Shrewsbury in January 1960. She is now marking her 55th year with the firm, which has seen huge changes since she was taken on. “When I joined Wace Morgan there were only four people working here – now we have over 80 based at three offices in Shrewsbury town centre and one in Newtown,” commented Ang, of Copthorne, who is married with two daughters and five grandchildren. “Although my role as a secretary has not altered that much, the technology has. I began using typewriters and we are in the digital age now, using smartphones, and digital dictation,” she commented. And of course fashions have altered since the swinging 60s when Ang was starting her career as an image-conscious young woman. “I used to come to work in hot-pants or mini skirts with my hair all backcombed. Styles have changed a lot over the years! “I have always loved my job, I never get up in the morning and think ‘oh no I have to go to work’. They are a great bunch of people here and I enjoy the company. I really don’t know where the time has gone,” said Ang, who works three days a week. Senior partner Jeremy Taylor, who is based at the Wace Morgan Law Shop in Shrewsbury’s High Street, paid tribute to Ang at a presentation where she was presented with a bouquet of flowers and a bottle of champagne. “She has been part of the Wace Morgan family for 55 years – an incredible achievement. She rarely has a day off, she is lots of fun and her work is of a superb quality.